I was tempted to title this post “Beating the Heat” but that title just didn’t sound right. We didn’t really beat the heat during last week’s high temps in Chicago, we endured it with the help of air conditioning and iced water. We spent the 100-degree days inside. The evenings hardly cooled down at all, so we went to the pool to cool off. To avoid heating up the kitchen and working our air conditioner harder than it was already working, I grilled everything I could think of. Chicken, pork chops, hot dogs and brats. And of course, burgers. Do you remember in the late ’80’s, when three gray whales were trapped under the ice in Alaska? They didn’t make it out into the open sea in time to migrate south for the winter. The media caught this story and it went national, capturing the country’s attention. A lot of money and effort went into rescuing the whales from under the ice. Drew Barrymore stars in the movie Big Miracle that tells this true story. We rented it to go along with our pizza. Watching this movie which takes place in Barrow, Alaska, made us feel almost chilly! It was the perfect movie for a hot summer’s night! Lily and Emmy really enjoyed Big Miracle, especially since we just got back from our Alaska vacation. 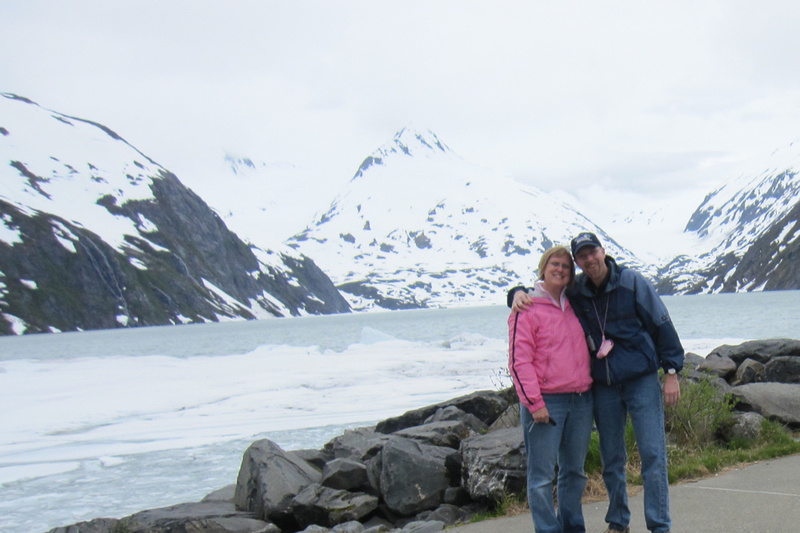 When we were up in Anchorage in early June, there was still quite a bit of snow up in the mountains. Does this picture make you feel chilly? Slice the rolls into half. Make sure the halves lie flat by slicing a little off the bottoms if necessary. Spread a small amount of sauce on each half. Cover with shredded mozzarella cheese. (I do not buy pre-shredded cheese–I think it melts and tastes much better when I shred a block of cheese myself! Pre-shredded cheese has a coating to keep it from sticking in the package which also can change the taste.) Place your favorite toppings on the layer of cheese. Place on preheated gas grill, set to the lowest flame. Grill for about 10 minutes, or until your toppings are hot. Sprinkle with crushed red pepper if desired. What’s on your grill this summer? 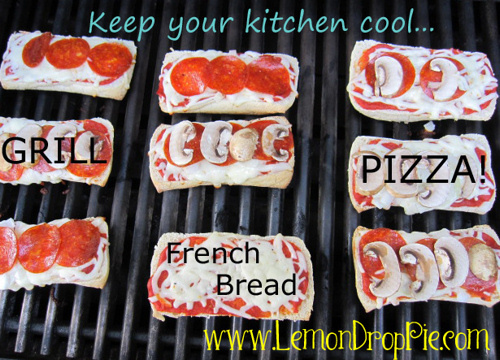 What a great way to beat the heat with the grilled pizza. I enjoyed that movie too! The Grilled French Bread Pizza sounds so delicious. I can't wait to try them! What a great idea! Something that Jude and Jimmy would both eat!